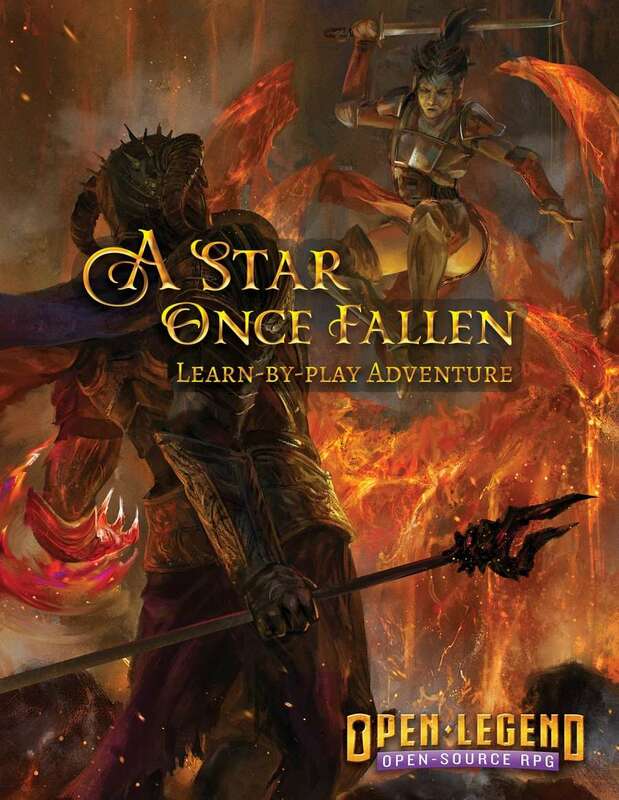 The first adventure module for the Open Legend roleplaying game system, perfect for experienced and new players alike. Marooned on an uncharted island, caught between two warring tribes, and threatened at all hours by a dormant volcano prophesied to awaken again. Can our brave heroes discover the legend of Starfall Island before they fall prey to its denizens? In this introductory adventure, you’ll learn the basic rules for Open Legend by playing through an adventure. One player will take the part of the game master (or GM) and be responsible for directing the adventure and controlling the enemies, monsters, and non-player characters (NPCs). The rest of the players will act as the player characters (or PCs), each controlling a hero of legend who will accomplish great things. Check out our YouTube playlist below to see this adventure live via Encounter Roleplay's Twitch channel. If you enjoy this basic set, be sure to check out the full rules, available for free at www.openlegendrpg.com. To find and discuss with others playing Open Legend, join our community at openlegend.mightybell.com. You thought the job would be easy. Hitch a ride on a trading vessel, protect it from pirates, and earn a few gold and a free trip to the City of Sails. All in a day’s work for an adventurer like yourself. But there’s not much your swords and arrows and spells can do against a typhoon. You don’t remember much - the flash of lightning, the howl of wind, the doomful crack of the mast as it split down the middle - but one memory stands out perfectly in your mind. Brings sword and axe and spell at hand. It fills heart, soul, and mind with greed. Ceaseless war of clashing armies. But her wormtongue song is ever fell. Shall end the long, eternal fight. The star will rise another day. Is there a recommended number of players for this? I didn't see it mentioned. There are now two identically-named files. How do we determine which one is the most up-to-date? Has the adventure been updated (as of Nov 16) to accommodate the latest rules changes? Juat curious about something with character creation. in particular I noticed that the attribute scores are a little different then the core rules. I know this is a simplified version but was wondering if that was by design? You're right Chris - a few things have gotten out of sync since the Core Rules have been bombarded by feedback and change proposals by the massive influx of new users from the Kickstarter. We will get those squared away, thanks for checking on it! Is this adventure more or less up to date with the Alpha release of the rules for kickstarter backers?